In the Footsteps of Pope John Paul II in Krakow. The greatest citizen of Krakow, Poland resided in Vatican from 1978 to 2005. Before having taken over the Holy See as Pope John Paul II, Karol Wojtyla had lived in Krakow for four decades – practically through his entire adult life until his assumption of the papacy. Here he spent his formative years as a student and then as a young priest, a theologian and a philosopher, a playwright and a poet. And here he made most of the breathtaking ascent from the position of a humble curate at Krakow’s church of St. Florian’s to university professor to Krakow bishop to cardinal to the Vicar of Christ. from 1951 to 1963 have been turned into the Archdiocese Museum with a department devoted to the late Pope. If one intends to visit places connected with the life of the man who shepherded the Church into its third millennium, he should start at Debniki, Krakow’s residential district vis-a-vis the Wawel Hill across the Vistula river. Born in the town of Wadowice some 30 miles southwest of Krakow, 18-year-old student Karol Wojtyla moved in to a Debniki basement room at 10 Tyniecka street in 1938. Next September Nazi Germany invaded Poland and under their five-year-long occupation he was forced to work in the nearby Zakrzowek quarry while concurrently studying at an underground theological seminary. First thing every morning he heard Mass and went to Communion at the large, modern Debniki parish church of St. Stanislaw Kostka’s where also young Father Wojtyla would say the second Mass in his life on November 3, 1946. He said his first Mass a day earlier in the 12th-century Crypt of St. Leonard’s under the Wawel Cathedral where Polish kings and national heroes are laid to rest. Could the newly ordained priest expect that barely seventeen years would elapse and he would take the Wawel Cathedral over as the Krakow Archbishop? Twelve of these seventeen he was to live at the foot of the cathedral, at the splendid Kanonicza street. Father Wojtyla resided at 19 Kanonicza street from 1951 till 1958, when he became bishop; and at the adjacent no. 21 till 1963, when he became the Krakow archbishop. Now both those houses are turned into the Archdiocese Museum which exhibits the church art. Yet Father Wojtyla’s old room looks as if he only recently walked out, complete with the furniture he once used. Added are such John Paul II’s memorabilia as coins and medals minted in his honor and robes he wore as university professor, bishop, cardinal and, finally, the Pope. There is also the exhibition of varied gifts presented to Pope John Paul II during his long pontificate. A five minutes’ stroll down the most charming Kanonicza Street and then through the Planty gardens will bring you to the gate of the stately Bishops’ Palace at 3 Franciszkanska street whose ample first-floor rooms were home to His Eminence Cardinal Karol Wojtyla since 1963 to 1978. Previously he had lived in the palace as a seminarist throughout 1945 and was ordained in its chapel on the All Saints Day AD 1946. 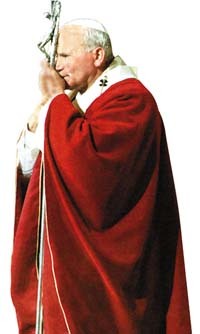 In October 1978 Cardinal Wojtyla left for Rome to participate in the conclave which elected him the Pope. In the ensuing year he visited his native Krakow for the first time as John Paul II, staying again briefly in the Bishops’ Palace. In the palatial courtyard one can see his statue commemorating the most famous master of the place. 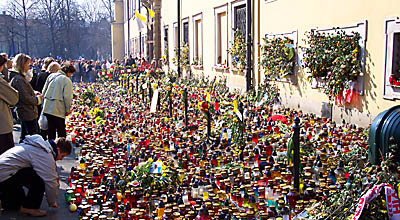 April 4, 2005, Mourners keeping vigil in front of the palace of Krakow's bishops where Pope John Paul II once lived. Wawel Hill in Krakow, the mecca of every Pole and a must for foreign tourists, is a microcosm of Polish history and culture. Poland's medieval rulers are buried under their sarcophagi in the Cathedral's nave. Visitors can also see crypts with the tombs of the Renaissance and later monarchs.